25mm x 35mm Vertical Mother of Pearl Pendant with couture sterling silver locking bail and coordinating crown bead. 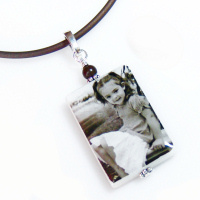 Tile is double sided and can use the same or different images for each side. Best suited for one to four subjects per image.